Give your daughter a wedding keepsake that she will always treasure - a personalized heartfelt poem to tell her how much she means to you. This exquisite picture frame with a lovely floral design is a perfect setting for this warm and sincere verse from a parent. 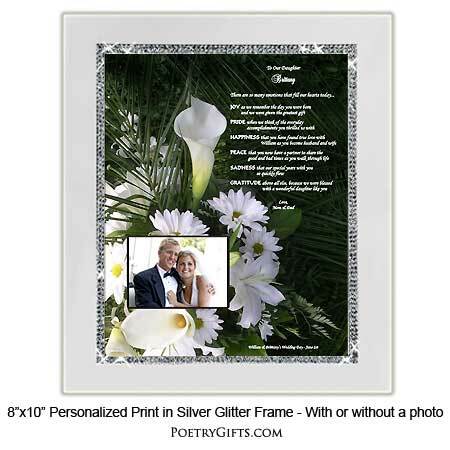 The stylish frame has a wide mirrored border with encased crystals that surround the personalized 8" x 10" poem print. This is a meaningful wedding gift for a daughter from her mom and/or dad. Read poem below in "Description"
Don't let the most important day of her life go by without telling her what's in your heart with this EXCLUSIVE wedding gift for a daughter. Modern 8x10 inch picture frame with glass front that has outside measurements of 10-1/2" x 12-1/2"
If an area for a photo is chosen the cut-out area measures 2-1/4" x 3-1/4"
blessed with a wonderful daughter like you. This is the perfect gift! Looks great and said everything I wanted for my Daughter. It arrived very quickly and it was very well protected for shipping. Highly recommend it! This poem said everything I wanted it to say to my daughter. She LOVED it. Frame looked beautiful. Will buy from this company again.